The warm sun with its dull brightness served as my alarm clock this morning, and in a daze, I wondered if spring had finally come to Boston. Two eye rubs later, I realized that I was not in Boston, but in California, where it’s spring all year long. I turned to my right, and there was sleeping Karl. However, for this post, I shall refer to him as birthday boy because that is exactly what he is today. I flew to California a few days ago for this very special occasion. There was no way I was going to miss his birthday – it’s one of my favorite days in the year after all! The birthday boy had class all morning and afternoon, so before he was due to get up, I snuck out of the apartment and came home with balloons and McDonald’s breakfast. Just for some birthday emphasis, I stuck a candle in the Egg McMuffin. While I prepared for the evening’s birthday festivities, it dawned on me that I have celebrated three of his birthdays already. How can that be? I’m pretty sure we’re still in the “honeymoon” phase. I’ve been told it’ll wear off soon – it’s been two and a half years. When I met Karl, he was just picking out medical schools to apply to and I was on a liquid diet, slowly recovering from an oral surgery. Now he’s in his second year of school, and I’m eating solid foods again. Karl works harder than anyone I know, and a little birdie told me that he has always been like this. I was told that while the other preschoolers were playing with toys, he took on the challenge of writing (prepare to be shocked) 1 to 1,000 on paper and succeeded. Quite the feat for a toddler. When I think about little Karl scribbling numbers with his little left hand, I can’t help but gush. I am pretty bummed that I’ll never get to see little Karl in action. However, I do get to watch big Karl do all the cool things he currently does in school. The other night, he took me down to the cadaver lab where he is a teaching assistant for an anatomy course. He had some prepping to do before lab the next day, so I came with to help. I’ll spare you the details of my help, as it is not food blog friendly. I had big plans to make his birthday cake this year – I even drew up blueprints! Somehow I remembered to pack the blueprints, but not any of my baking equipment. I vowed not to accumulate any extra baking equipment until I move back to California, so I turned to Susie Cakes in Menlo Park for a birthday cake. Time reserved for baking was now freed up, so I did some meal prepping for Karl. Because it was his birthday and also because I love the guy, I made him miso catfish stir fry. 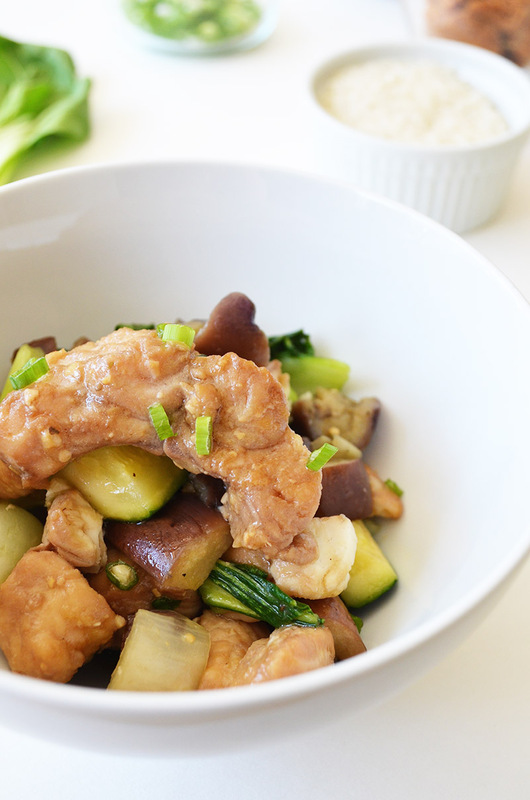 This dish is packed with lots of healthy veggies, and the sauce is absolutely amazing. The miso sauce complements the fresh vegetables and the fish so well. There is a lot of prep work in this recipe, but the steps are simple and the labor is worth the end product. 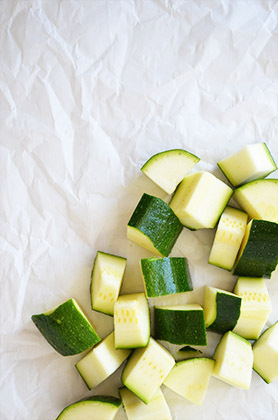 Roasting the veggies gives them a nice texture, which cannot be achieved if they’re only sautéed. This dish has four different vegetables (five if you include the onion!). It is easily one of favorite dishes because of its vegetable density. I’d say it’s very lovable, just like the birthday boy. In a small bowl, add the sliced catfish and soy sauce, toss to combine, then set aside. In a sauce pan, whisk the water and corn starch. Add the sugar, ginger, 1 clove minced garlic, and red miso paste. Cook the sauce over medium heat for 5 minutes, mixing frequently, then remove from heat. Preheat the oven to 350 F degrees. In a large bowl, combine the endives and bok choy with 1 tablespoon olive oil, salt, and pepper. On a baking sheet, roast the endives and boy choy for 5 minutes, then set aside. Increase the temperature of the oven to 400 F degrees. 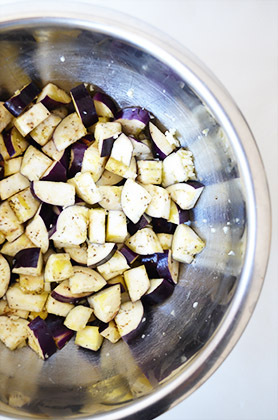 In a large bowl, toss to combine the eggplant, 1 tablespoon olive oil, 4 cloves minced garlic, salt, and pepper. Roast eggplant on a greased baking sheet for 10 minutes, then set aside. In a large saute pan, heat 1 tablespoon olive oil over medium-high heat. Cook the onions until soft and slightly translucent, about 4 minutes. 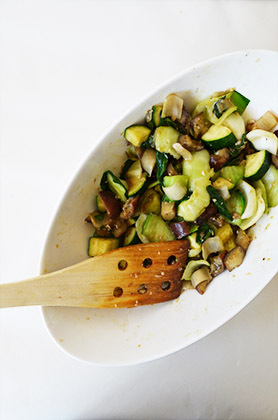 Stir in the roasted eggplant, roasted endives and bok choy, and zucchini. Saute the vegetables for 2 minutes, then add half the miso sauce and cook for another 2 minutes. Salt and pepper to taste. Plate and set aside. Add 1 tablespoon olive oil to the same saute pan. 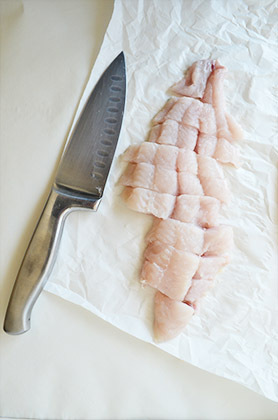 Saute the catfish over medium to medium-high heat for 4 minutes. Add the remaining miso sauce and cook for another 2 minutes, until the fish is opaque. Remove from heat and place the catfish directly over the vegetables. 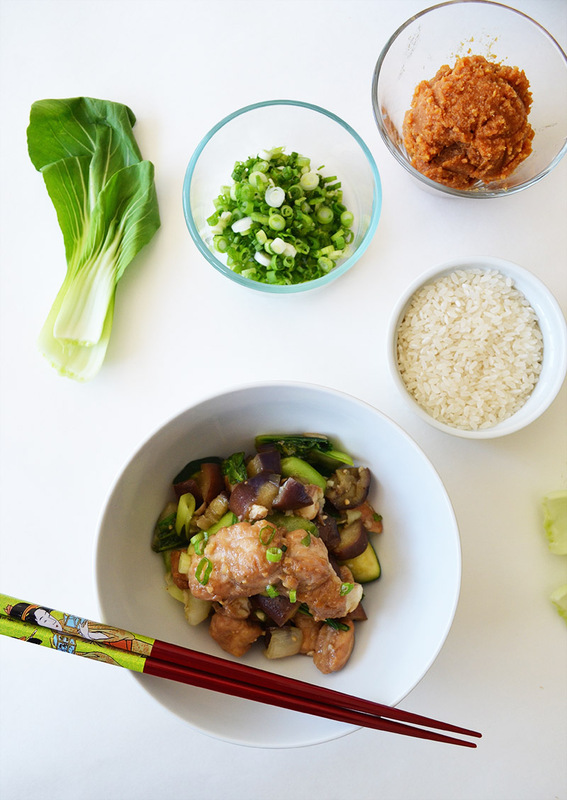 Garnish with sliced green onions and serve with rice. 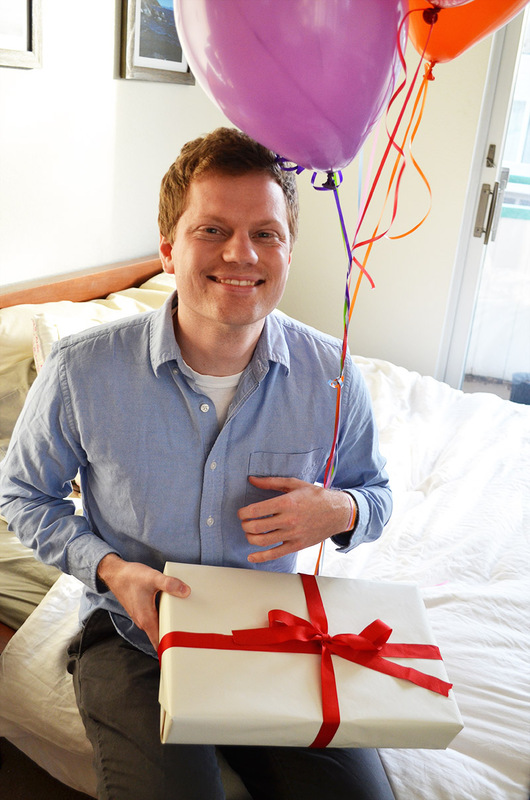 Picture above: Happy Karl with a birthday present and balloons tied to his wrist, because even 28-year-olds can accidently lose their balloons. 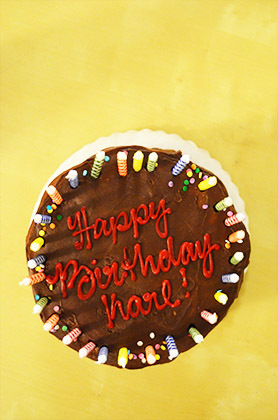 Picture below (left): Karl’s delicious chocolate birthday cake from Susie Cakes in awful lighting. 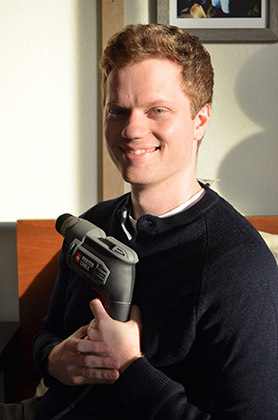 Picture below (right): Happy Karl in dramatic lighting with two of his birthday presents – a new sweater and a power drill! 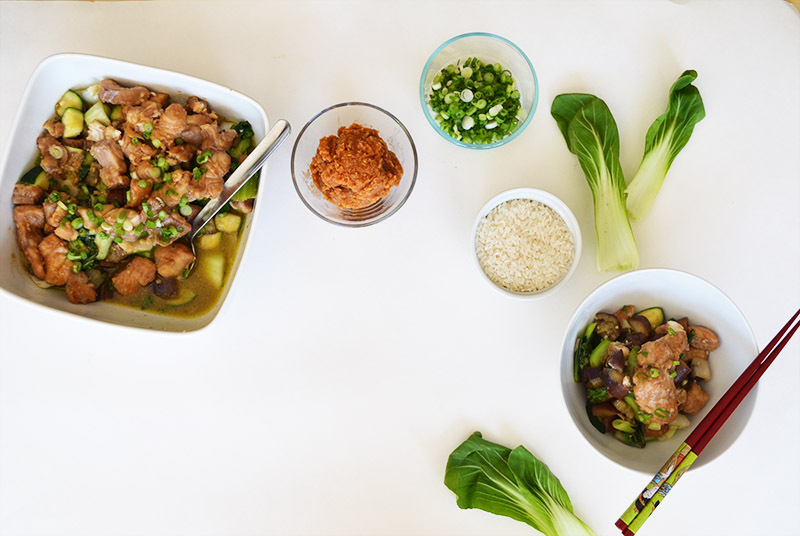 This entry was posted in Entrees and tagged bok choy, catfish, eggplant, endives, miso, seafood, zucchini. Looks very delicious, and interesting as always! I will try it soon. Glad you two had a fun celebration together, and I’m extra glad you love my wonderful son! So proud of you both!! Yay!! Happy Birthday to Karl! What a yummy dinner you made with the miso catfish. 🙂 He’s a lucky guy!